3 Bedroom Terraced House For Sale in Mansfield for Asking Price £125,000. SPACIOUS THREE BEDROOM PROPERTY! 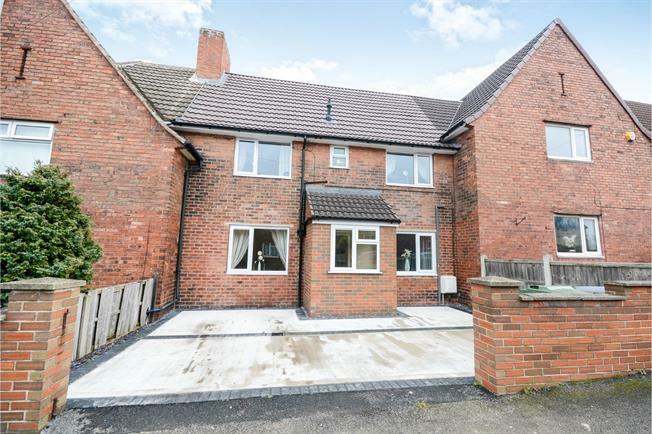 Bairstow Eves are pleased to welcome to the market this stunning, recently refurbished three bedroom town house for sale with no upward chain. This is a fantastic opportunity for families, first time buyers and investors to acquire this deceivingly spacious home within Clipstone Village. The property comprises a porch leading into a small entrance hallway that gives access to a large, bright living room that spans from the front of the property to the back with french doors leading to the garden. The entrance hall also gives access to the dining room to the front of the property with a door to the modern fitted kitchen. The first floor benefits from two large double bedrooms, one single bedroom and the modern family bathroom suite. Additionally this home has gas central heating, double glazed windows throughout, off road parking and an enclosed rear garden. Viewings are highly recommended so please call the office for viewing arrangements. UPVC French double glazed door, opening onto the garden. Double glazed uPVC window facing the front. Radiator and electric fire, carpeted flooring, ceiling light. UPVC back double glazed door, opening onto the garden. Double glazed uPVC window facing the rear overlooking the garden. Radiator, tiled flooring, ceiling light. Roll top work surface, fitted, wall and base and drawer units, stainless steel sink, space for, electric oven, space for, electric hob, space for washing machine, fridge/freezer. Double glazed uPVC window with frosted glass facing the rear overlooking the garden. Heated towel rail, tiled flooring, ceiling light. Low level WC, roll top bath with mixer tap, shower over bath, pedestal sink with mixer tap. Double glazed uPVC window with frosted glass facing the rear. Tiled flooring, ceiling light.